Despite their coveted value, the great brands of old media aren’t proving out to be much of an asset online. And to the extent old media is relying on the value of their brands to ensure a digital future, they are headed in the wrong direction. For this new analysis for Digital Quarters, we measured audience and visits (from comScore) for sites across the major media categories, comparing the metrics of sites operated under old media brands (e.g. ABC, Entertainment Weekly) in each category to those of new upstarts. Over the past year old media brands lost share of online audience to new media in nearly all of the traditional magazine categories (TV, entertainment, business, fashion, tech, and teens), while the offline brands in the News category grew share during that same period. 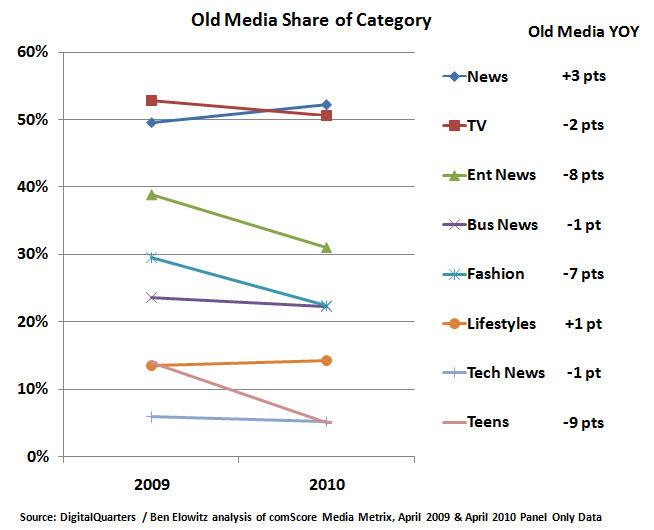 Although total visits were up 5% for old media, new media visits grew far faster — 10% — from April 2009 to April 2010, leading to share loss for old media in six out of the eight categories that we tracked. 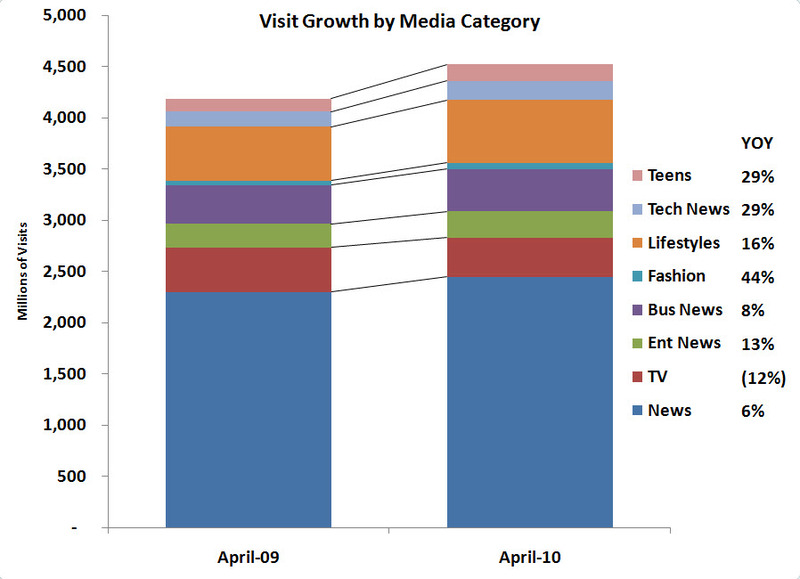 Overall visit growth was positive in all media categories other than TV, but despite this, old media brands experienced an absolute visit decline in Entertainment News and Teens which are rapidly shifting towards new media sources. Conventional wisdom has held that building a brand is a momentous challenge in developed spaces such as media; and that disproportionate returns accrue to the most established brands. But my new analysis shows that legacy brands are on the defensive, far more threatened by new entrants than the other way around. The upshot appears to be that upstarts’ execution is earning new audiences (and building their new brands), drawing audience on average away from more established players. The reason for this shift, and the dominance of new media in categories such as Tech News is simply that the old media magazine model is ill equipped to compete with more nimble online competitors. For the most part, weekly and monthly publications are struggling to keep up with the new pace of information exchange and social interaction demanded on the web. Understandably, the value to consumers of days, weeks, or months-old “news” on fashion trends, celebrity gossip, and technology is far lower in the presence of up-to-the-minute coverage from new sites. However, the success of offline brands in the News category offers hope for other old media brands. Companies such as The New York Times, BBC, and ABCNews have grown their online presence and are clearly investing in digital as core to their business. They are actively experimenting with rich media, social marketing, and engaging their audience. But while news outlets have always operated on a fast pace, magazines are at a particular disadvantage in that they are not structured to turn information around quickly. For old media magazine brands to maintain or grow share, they’ll need to go further by transforming their organizations, incentives, and sources and embracing the new definitions of publishing quality to provide the experiences that consumers are now seeking online. With online share falling — in some cases dramatically — now is the time for offline legacy publishers to take action and get their brands working harder before it’s too late. Source: comScore panel-only visit data for April 2009, July 2009, September 2009 (panel only was unavailable for October), January 2010, and April 2010, including only properties with more than 500,000 monthly unique users. Properties were manually categorized into old media if they originated offline, and new media if they are entirely online or originated online (e.g. TMZ and MSNBC are considered new media). comScore category names: Business News/Research (Bus News); Entertainment – News (Ent News); Beauty/Fashion/Style (Fashion); Lifestyles; News/Information (News); and Technology – News (Tech News); Teens; Entertainment TV (TV).